How Our Rich History Keeps Us Moving Forward – christopher consultants, ltd. Here at christopher, we celebrate our surveyors for being on the cutting edge of new technology, including 3D scanning, drone work and even robotics. 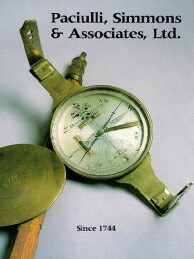 But did you know we also have a rich history in the field of survey, dating back to 1744? Anyone who was familiar with engineering firm Paciulli, Simmons & Associates, Ltd. (Paciulli) might have known that they were recognized as the oldest business in the Washington Metropolitan area by the Washington Business Journal. But delving a bit deeper reveals that there is much more to the story of Paciulli surveyors, including being a part of the survey crews that helped shaped Northern Virginia into the region it is today. In 1744, Paciulli Simmons was founded by Henry Gunnell. The same year Gunnell surveyed a track of land for William Fairfax, neighbor to fellow land surveyor George Washington and of the Fairfax family after whom the county is named. In 1746, Gunnell surveyed the two-acre tract that became the Fairfax courthouse. A few years later, Gunnell would work together with George Washington’s vestrymen to survey Gunnell’s Church, which was later renamed Falls Church. Through the years, the family business and land surveying knowledge would be handed down from Henry Gunnell through his sons and sons-in-law. Eight generations of the family would not only watch Northern Virginia change and grow, but actually have a hand in mapping and determining the layout of much of the region. In 1890, J. Owens Berry, husband of Gunnell’s great granddaughter, signed the papers incorporating the Town of Vienna. As Northern Virginia experienced a period of growth in the early 1900’s, the company (now named J. Owens Berry & Co.) mapped large portions of what is now McLean, Vienna, Fairfax, Dunn Loring and Oakton. In 1958 the company was passed to Joseph Berry’s grandson-in-law Orlo Paciulli, who had an engineering degree from the U.S. Naval Academy. It was then that Paciulli recognized a shifting in the business environment and diversified the business by adding engineering and land planning services. In 2017, Paciulli became a part of christopher consultants, ltd. Paciulli’s history continues to be a point of pride for the firm and especially our survey team. And we continue to use our depth of knowledge in the history of surveying to keep moving us towards the future.